I frequently tell people, “more and more we’re talking to our devices”. I say this because in the early days of search I remember pausing before I’d type a query — and ask myself: “what words do I need to type in order to get the results I want?” I haven’t done that in a long time. Today (regardless of the interface) I just “say” what I want to the search engine, as if I’m talking to a person. Magically, relevant answers are returned. It’s natural. It’s efficient. And it’s only the beginning. Conversational search technology is here and quickly accelerating. As voice recognition improves, we’re increasingly talking to our devices. Google’s Director of Conversational Search, Behshad Behzadi, delivered the keynote at the Search Marketing Expo (SMX) West 2016, entitled The Future of Search. It features advances in conversational search (aka voice search) and context — areas where Google is investing strategically. Packed with live demos, and using today’s technology, Mr. Behzadi demonstrates the high degree of accuracy in Google understanding natural voice queries. And if that’s not enough, amazingly, he shows how the context of your voice query is well understood. In other words, the search engines are getting better at putting your query into context and knowing what you mean. The video is long (47 min. ), but worth every minute. So I’m keeping this post short. As of 2015, more people search the internet on mobile devices than desktop. 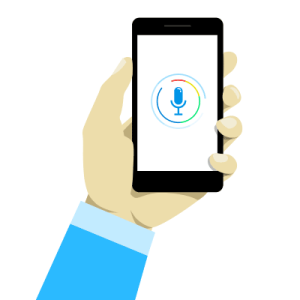 Mobile lends itself to voice search (our hands are busy, the keyboard is small..). Voice recognition is accurate: 8% word error rate with voice recognition today. Context for speech recognition is improving: what you said before, what’s on your screen, where you are..
People use more natural sentences in voice search. Google is investing in long tail questions to be answered. And making great strides in answering longer and more natural types of questions. So then, what is the future of search? Answer: It’s the ultimate assistant.